This mirror is all but luxury and style. Shaped perfectly, the 24" X 36" LED Bathroom Mirror is smooth, glossy and sophisticated in presentation. This is an eco-friendly mirror with a silver-back. The glass mirror is a perfect for a beautiful bathroom reflection highlighted by a backlit LED enhancing your beautiful style and appeal. The crisp and impeccable reflection tells it all with the lighting up of 120 LEDs every meter. This backlit mirror provides for an exceptionally high CRI going beyond 90 so you get that perfect daylight imagery reflected with accuracy. 1. This eco-friendly CCT chargeable mirror is the perfect way to pamper oneself and you can have clear and true reflection of yours on the mirror. 2. 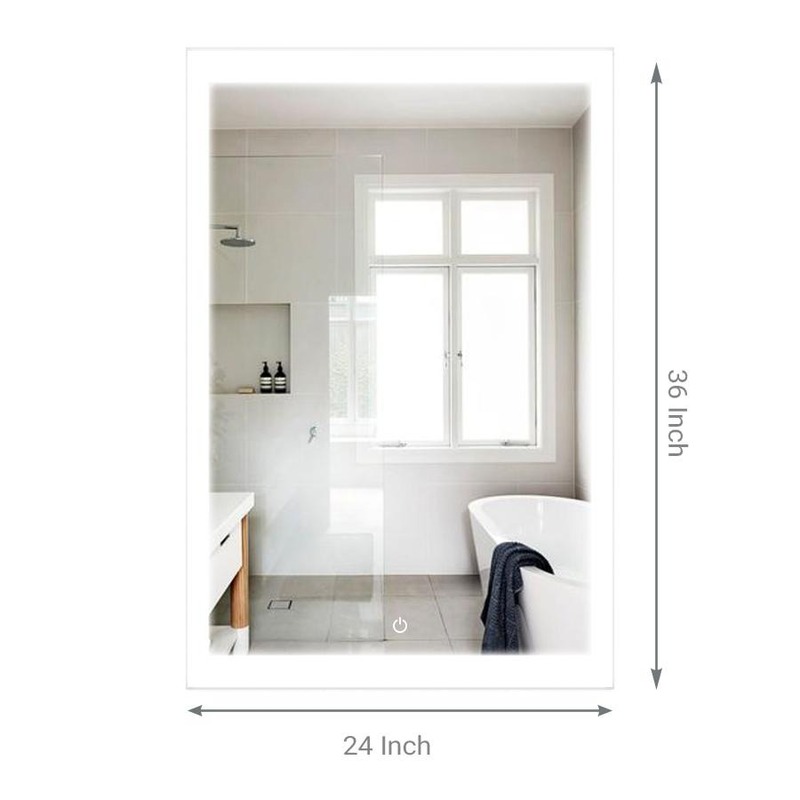 These 24" X 36" LED Bathroom Mirror uses 120 LEDs per meter to deliver premium quality lighting and with the easy On/Off touch button, you can easily manage the functioning of the lights. 3. Also the in-built defogger will give you energizing and refreshing experience and you don’t need to manually clean the fog. 4. The Power switch of this LED Bathroom Mirror can enable you to change the color of the light beam from 3000K to 6000K so that you can apply make-up under different levels of color glow. 5. These mirrors are waterproofed and UL approved that are perfect to be used at the wet locations as well. 6. Get these ETL certified mirrors that come with 2 Years of warranty from the manufacturer ad well thus making them more useful and appropriate. So install this 24" X 36" LED Bathroom Mirror inside your bathrooms so that you can have appealing personality by doing the right makeup under the right and accurate lights.